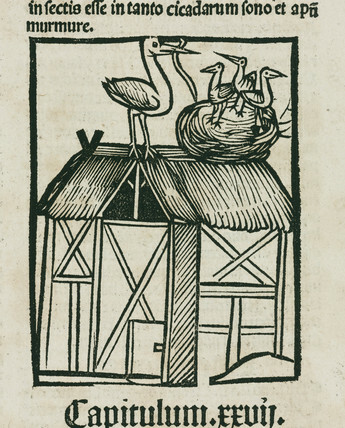 Storks nesting on a roof, 1497. Woodcut from 'Hortus Sanitatis', ('Garden of Health'), printed by Johann Pruss in Strasbourg in 1497. Hortus Sanitatis was the most popular and influential herbal of its time, and served as an encyclopaedia of all knowledge and folklore on plants, animals, and minerals. It combines elements of natural history with subjects traditionally found in herbals, and includes many mythical creatures. Many of the woodblock engravings were taken from the German 'Herbarius' (1485), itself derived from earlier herbals, repeating many of their errors.